One of the hardest ideas for people to accept is that the universe is in divine order – that everything is exactly as it should be and there are no accidents. Theoretically, it's quite understandable, but to actually accept this principle is difficult. When things go wrong, it is almost human nature to look for someone or something to blame, especially when there is evidence to support your accusations. Yet, when this principle is embraced, and an effort is made to uncover the hidden lesson, your life may be enriched. My girlfriend, Christine, and I just came back from a 12-day tour of Tibet, that provided us and our fellow travelers with several opportunities to internalize this lesson. We joined a tour group from Taiwan comprised of Buddhist pilgrims, including two monks, who were seeking to visit many of the famous monasteries in Tibet, as well as experience the region's natural beauty. Only a few spoke English; the tour was conducted in Mandarin, with Christine translating for me. Our tour operator, Chang, worked very hard to obtain all required permits and to keep things running smoothly. He told me that my application was particularly troublesome. It had been accepted, rejected and accepted on three successive days and my permit to enter the Potala Palace was not granted until the day before we were scheduled to visit. Despite his proven diligence, on three occasions he had me questioning his judgment. On the first occasion Chang decided to take a shortcut to the desert monastery, Samye, to save 3 ½ hours of driving time. The shortcut required we conduct a 50-minute crossing of the Yarlung Tsangpo River in a flat bottomed boat, followed by a 30-minute drive in the back of a modified pickup truck on a dirt road that resembled the surface of the moon. The 13,000-foot altitude and the reflection of the sun off the water made the Tibetan sun extremely intense. Even more challenging was the truck ride, where dust and rocks buffeted us while we bounced over potholes the size of small school buses. One local who shared our ride almost got bounced out of the truck. It would have been a simple task for Chang to tell everyone what to expect, but it didn't occur to this otherwise diligent operator. He apologized profusely, but several people were very upset. The second occasion was the opening of the Shoton Festival, where over 300,000 celebrants from all over the world had gathered in Lhasa. 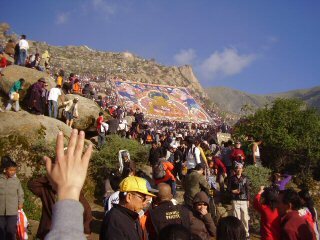 At sunrise, monks unveil a huge thangka or scroll-painting of Shakyamuni (Guatama Buddha) on the side of the mountain. The brightly colored thangka only remains visible for a few hours before it is taken down and placed back in the monastery until the following year. We boarded our tour bus at 5 AM, anticipating that we would be driven to the festival. Unexpectedly, the bus dropped us off two miles away; we had to walk up the mountain, at 12,000 feet altitude, to get to where we'd be able to see the unveiling. Part of the uphill journey was on paved roads, but the last portion was on dirt paths. Again, it would have been a simple task for Chang to tell people what to expect and to wear proper footwear, but it didn't occur to him. Several people were forced to walk in flip-flops and casual shoes that were completely inappropriate for the terrain. The third incident was our visit to Zhongshan Castle, overseeing the Palco Monastery. 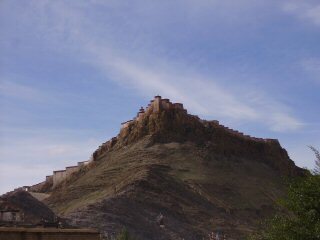 To get to this fortress, we had to climb up a winding road and several steel ladders to reach the top of the fortress, where we had a spectacular view of the nearby town and countryside. Again, Chang neglected to tell people what to expect. I was puzzled. On the one hand, Chang had been extremely diligent in obtaining our permits and planning the most minute details of our activities, and yet, he had neglected to advise us of the obvious challenges we'd have to face. Starting from the premise that everything is in perfect order, I tried to reconcile this inconsistency. I realized that the people who were most inconvenienced were the ones that were most fearful of undertaking such activities. One woman admitted that after the boat and truck adventure she had unsuccessfully tried to call her husband hoping he'd be able to arrange an immediate flight back to Taiwan. She said that had she known what to expect, she would never have come. It was not in Chang's nature to have shrewdly planned this outcome. He had revealed just enough information to attract the right people to the tour and yet been almost negligent in withholding key information to make the journey more manageable. He was no Machiavelli. Rather, he had acted as a channel for the universe to allow some people to experience and develop their own potential to a far greater degree than they ever would have. Those of us not physically challenged were not inconvenienced. In hindsight, several people would not have gone on the tour had they known what to expect. And they would have lost out on, not only some spectacular scenery and historic sites, but rather, one of life's most precious gifts: a greater knowledge of themselves and their capabilities. 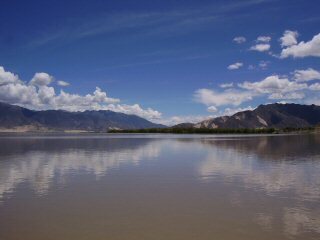 For more pictures of Tibet, visit: Tibet Travelogue. Get a FREE Escaping the Matrix Audiobook and 9-lesson ecourse to help you overcome stress, fear and anger, dis-identify from your emotions, take back your power, connect with your innermost self and "escape the matrix." Copyright © 2003-2011 by Edwin Harkness Spina. All Rights Reserved.